So much has happened in the news this week when it comes to one of the world's most famous 16-year-olds, Brooklyn Beckham. First we saw some more Instagram photos of him wearing that trendy Adidas cap - black and white photos of course, and then there were some truly impressive videos where he was showing off his exceptional skateboarding skills. There were no less than two boarding videos, where Brooks can be seen performing stunts, going up ramps, doing jumps and pulling faces, and he was clearly pleased that he didn't fall over judging by the relieved look on his face. The videos were posted to his Instagram account and soon racked up literally hundreds of thousands of likes, while the papers quickly got hold of them also and turned them into top newspaper articles and headlines. Brooklyn Beckham has quickly emerged as a role model for children the world over, and so many parents were shocked when Golden Boards recently took a somewhat controversial photo of some young gangster children playing with what looked like toy guns. Despite being liked around 400,000 times on his Instagram account, the photo (black and white, obviously) was strongly criticised by the press, who all seemed to agree that it wasn't really appropriate. We noticed that he has since removed this photo. We genuinely do think that it is a shame that Brooklyn got such bad press for what was actually a really nicely composed photograph. 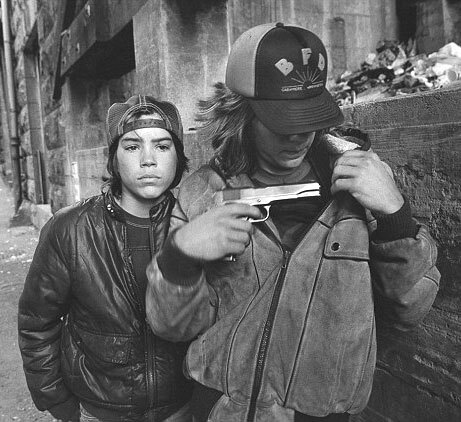 He was clearly just trying to tell a story and illustrate the life of ghetto kids through this gun image, but because he is the golden child of David and Victoria, and very much in the public eye, perhaps it wasn't really appropriate. We do hope that his creative flair and artistic nature doesn't get too stifled by the interfering press though. Chin up Brooklyn.